Umbria Press is a publisher and book packager. It publishes books for authors and private clients, undertaking all publishing functions: editorial, design, illustrations, book jackets and production. It provides sales and distribution to the book trade, wholesalers, Amazon etc. It handles the serial, book rights and other revenue streams for its titles. Umbria Press books in print are available to the book trade through Vine House Distribution: sales@vinehouse.co.uk. 01825 767396. Individuals who would like copies of Umbria Press titles can also contact the publisher. Umbria Press also acts as a literary agency for a range of clients. It provides consultancy services for publishers and the book trade, including: the sale of small publishers; advice on sales and distribution; and advice on the restructuring of book companies and general publishing services. 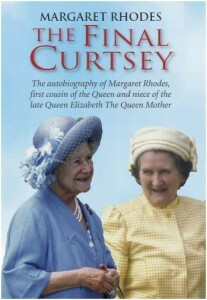 The Final Curtsey by Margaret Rhodes – is a publishing sensation and Sunday Times no 1 best seller.